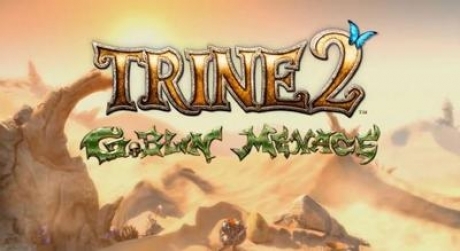 Goblin Menace is an expansion pack that was released for Trine 2 on the PC in September 2012. It was also included in the Wii U version of the game, which launched with the console in November 2012. The pack features a brand new story, six new levels and additional skills. Goblin Menace takes place straight after the events of Trine 2. The threat posed by Isabel has been dealt with, but the goblins that the heroes encountered in the kingdom have planned an invasion of their homeland. The goblins take Amadeus's wife hostage, which allows the goblins to capture the heroes and send them into exile to a distant desert. On their travels they discover that this place was actually the goblin homeland but it was destroyed by desert worms. The trio fight and defeat a giant worm, before discovering (and taking) a flying carriage used by the goblins and set course towards their own homeland. There, they confront and defeat the leader of the goblin invasion and rescue Amadeus's wife.